Cities and states are deploying a wide variety of incentives to promote more adoption of electric vehicles to reduce emissions and improve our energy security. Consumers in Houston can get a state subsidy for buying a new EV. In the Phoenix area, EV buyers get registration fees waived and single-occupant HOV lane access. EV drivers in Portland receive fewer city and state incentives, but benefit from more publicly available charging infrastructure. EV incentives vary by the amount consumers can save, how the incentives are applied, and who is offering the incentive. A new report sheds light on how the 25 largest U.S. cities stack up in promoting EV deployment. These cities together represent more than half of the public electric vehicle charging infrastructure in the U.S. and about two-thirds of new electric vehicle registrations. The white paper published by the International Council on Clean Transportation with input from C2ES and C40 and support from the 11th Hour Project, catalogues data on policies and actions by state agencies, municipal agencies, and local utilities that promote EV sales and analyzes the benefits to consumers. According to the report, “The current diversity of electric-drive promotion actions provides a rich laboratory for what is working.” You can see the spectrum of consumer EV incentives below. 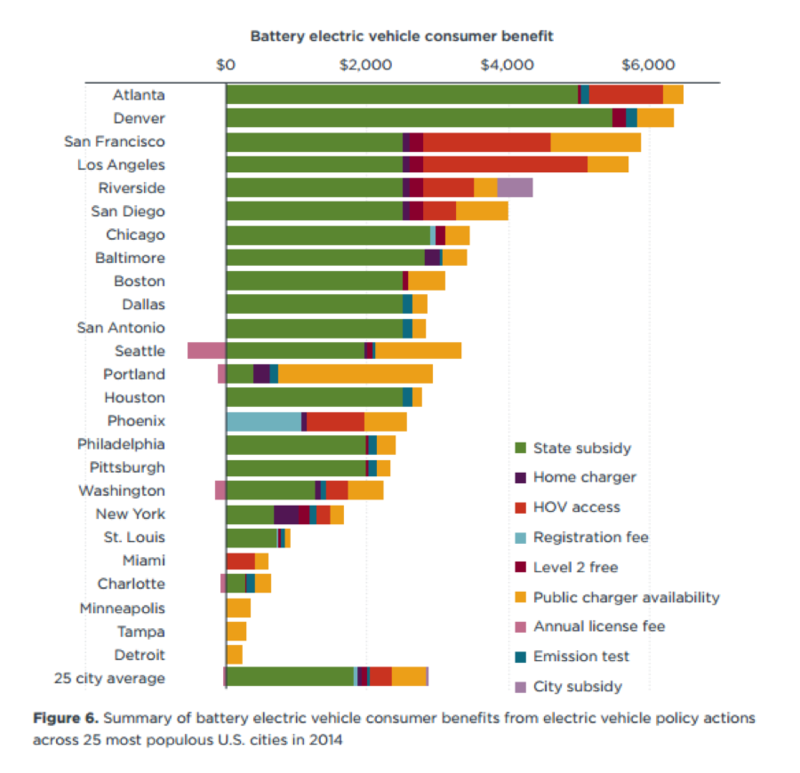 Cities that provide the largest economic benefit to EV owners typically have the largest state EV purchase incentives. These incentives include tax credits or rebates for buying or leasing an EV, or waiving state sales taxes on EVs, as in Washington state. The value of a policy to the consumer may vary by city, even in the same state. For example, California allows EV drivers to use HOV lanes even if they are driving alone. Drivers in traffic-choked Los Angeles may get more value from this than drivers in San Diego. Similar incentives may not necessarily have the same impacts in different cities. For instance, Portland’s extensive public charging network may have helped spur all-electric vehicles sales to three times the average U.S. all-electric vehicle uptake rate. 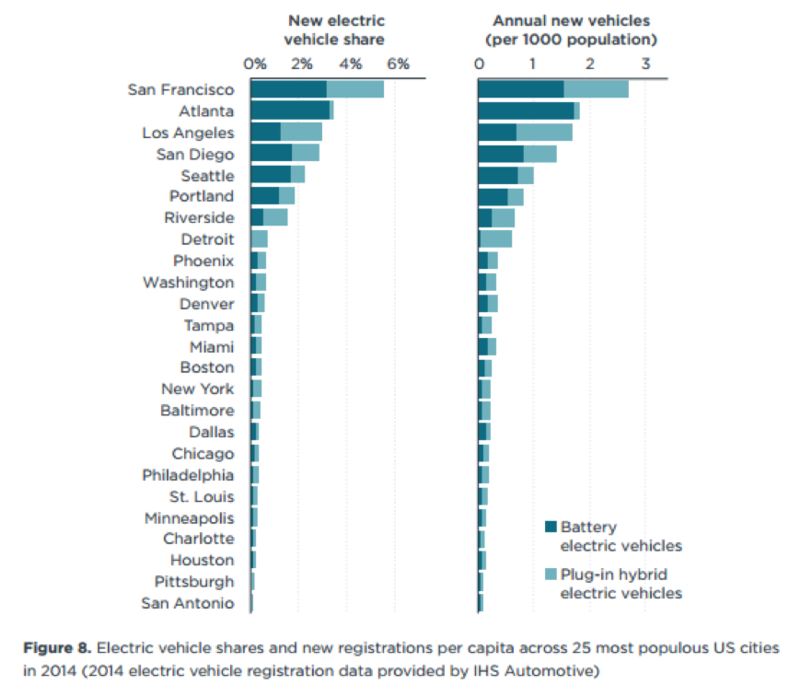 But the EV uptake rate in Boston and Baltimore fall in the middle of the pack, even though both cities are in the top 10 of cities surveyed for public charging. Similarly, Georgia’s now-defunct $5,000 all-electric vehicle consumer tax credit helped make Atlanta the second largest EV market in the nation. Colorado’s similarly generous EV consumer tax credit has not had the same effect on Denver’s EV sales, which can be seen in the chart below. The variety of actions the 25 largest U.S. cities have taken to advance EV deployment has created an experimental marketplace. No one city has a total consumer benefit package that is exactly alike. The lessons learned by examining the effectiveness of this diverse mix of EV incentives could help other cities, in the U.S. and globally, determine the best path forward.